Unlike mosses and most ferns, gymnosperms produce two types of spores—male microspores and female megaspores. Microspores grow into male gametophytes, while megaspores grow into female gametophytes. The production of different types of spores is called heterospory (HET-uhr-AHS-puh-ree). Thus, the gymnosperm life cycle is called heterosporous (HET-uhr-AHS-puh-ruhs) alternation of generations. All seed plants, spike mosses, quillworts, and a few fern species have heterospory. The microspores of heterosporous plants produce male gametophytes that stay attached to the much larger sporophyte and develop into pollen. Pollen can be transported through the air to female gametophytes. Sexual reproduction in seed plants therefore can take place independent of seasonal rains or other periods of moisture. Figure 30-3 shows the life cycle of a conifer, the most common kind of gymnosperm. 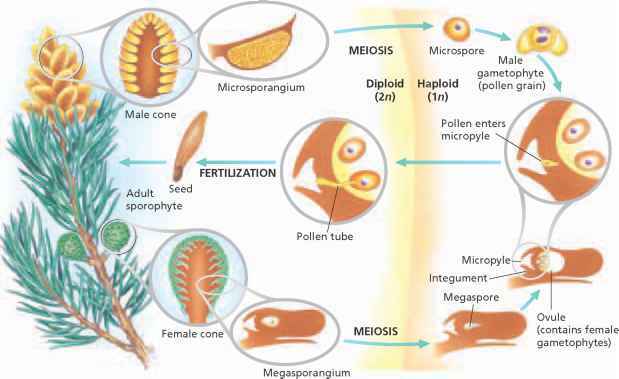 The life cycle of a gymnosperm alternates between a large sporophyte (the dominant generation), which produces two types of spores in cones, and microscopic gametophytes, which produce gametes. Female gametophytes produce eggs, and male gametophytes produce sperm. In the pine (a conifer), sexual reproduction takes more than two years. During the first summer, a mature pine tree produces separate female and male cones. The female cones produce megaspo-rangia, while the male cones produce microsporangia. The following spring, cells in all sporangia undergo meiosis and divide to produce haploid spores. These spores never leave the parent to develop independently. Megasporangia produce megaspores, which develop into megagametophytes, or female gametophytes. A thick layer of cells called an integument (in-TEG-yoo-muhnt) surrounds each mega-sporangium. The integument has a small opening called the micropyle (MIE-kroh-PlEL). Together, a megasporangium and its integument form a structure called an ovule (AHV-yool). Two ovules develop on each scale of a female cone. Microsporangia produce microspores, which develop into microgametophytes, or male game-tophytes. A pollen grain is a microgametophyte of a seed plant. The male cones of a pine release huge numbers of pollen grains, as seen in Figure 30-4. Pine pollen travels on the wind, and only a few grains may land on a female cone. The pollen grains drift between the cone scales until they reach the ovules. The transfer of pollen to ovules is called pollination. A drop of fluid at the micropyle captures the pollen grain. As the fluid dries, the pollen grain is drawn into the micropyle. After pollination, the female gametophyte within the ovule produces archegonia and eggs. After pollination, the pollen grain begins to grow a pollen tube, a slender extension of the pollen grain that enables sperm to reach an egg. Unlike the sperm of seedless plants, pine sperm do not have flagella and they do not swim to an egg. The pollen tube takes about a year to reach an egg only a few millimeters away. During this time, two sperm develop in the pollen tube. When the pollen tube reaches an archegonium, one sperm unites with an egg to form a zygote. 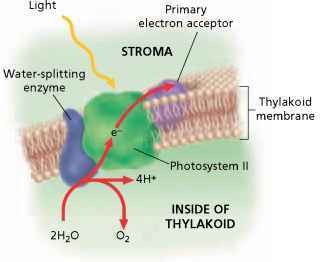 The other sperm and the pollen tube die. Over the next few months, the zygote develops into an embryo as the ovule matures into a seed. Why are gymnosperms called heterosporous? Why the gymnosperm are called heterosporous?